Under EPA’s final Clean Power Plan, states must submit initial compliance plans or demonstrate progress toward that goal by September 2016. Considering the complex nature of the rule and the intrastate coordination (among various agencies) and interstate planning (particularly when considering trading programs) that will have to take place, policymakers and advocates may want to start actively preparing for their role in the process as soon as possible. The Synapse Clean Power Plan Toolkit can help state agencies, public interest groups, and others zero in on cost-effective compliance plan options for any state or region affected by the rulemaking. 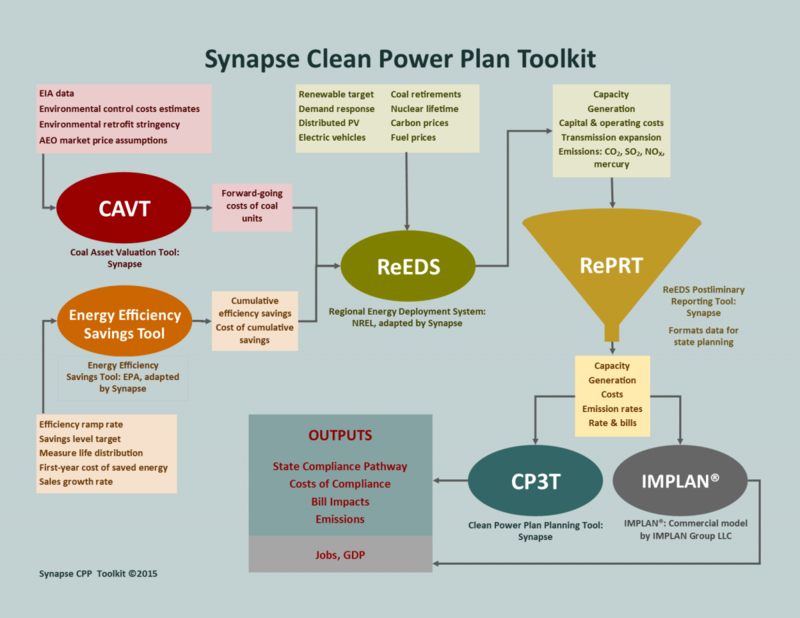 The Clean Power Plan Toolkit can be applied by Synapse experts to meet a broad range of needs. As part of this toolkit, Synapse also provides free tools for users who want to perform their own first-pass analysis. The Clean Power Plan Planning Tool (CP3T), recently updated to meet the specifications of the final rule, allows users to optimize future energy scenarios for Clean Power Plan compliance by adjusting fossil unit capacity factors, renewable energy and energy efficiency projections, unit retirements, and 111(b) unit additions for each state. Synapse’s Coal Asset Valuation Tool (CAVT), a spreadsheet-based database and model that determines the future economic viability of coal units, has also recently been updated. If you have previously downloaded versions of these open-source tools, be sure to download the new versions today. With new versions of CP3T and CAVT now online, Synapse is ready to start using the full suite of tools to assist state agencies in preparing initial state plans and to assist consumer and environmental interest groups in being effective stakeholders throughout the compliance process. Synapse offers a range of services for clients with varying modeling requirements, from providing pre-loaded CP3T files to analyzing client-designed scenarios using a combination of in-house and commercial tools. Using the full toolkit, Synapse can determine potential compliance pathways; costs of compliance; bill impacts; and scenarios’ effects on emissions, jobs, and GDP. You can explore options for services and pricing here. Contact us at environ@synapse-energy.com to discuss how we can help you with your Clean Power Plan-related project. Interested in using CP3T to perform first-pass compliance planning? Don’t miss our webinar tomorrow at 2 PM EST on how the tool has been updated since the release of the final Clean Power Plan. Register here.